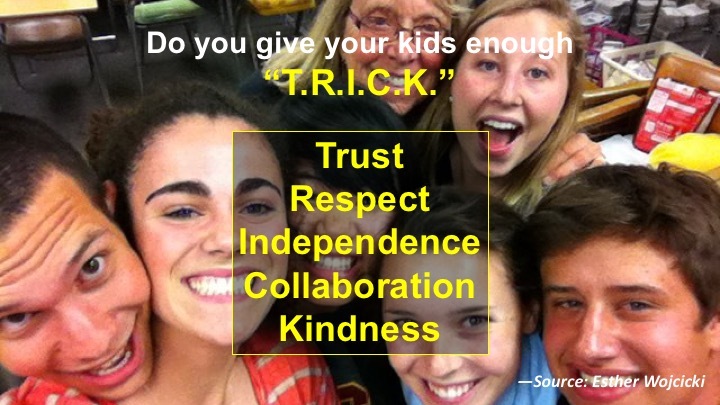 In an earlier post, I wrote about master teacher Esther Wojcicki’s “secret sauce” for working with her students: the acronym “T.R.I.C.K.,” standing for Trust, Respect, Independence, Collaboration and Kindness. In that post I quoted what she has written, in her book Moonshots in Education, about Trust. ”Teachers must respect their students, especially in today’s world, where class members may come from different backgrounds and experiences. Each student has unique gifts, even if here she also has unique problems. As a teacher, I know how difficult it can be to respect students to create problems in the classroom, but the teacher must show respect. It helps students to feel better about themselves. We all like independence. For most children, the desire for independence starts at age 2 — they want to do everything themselves, to their parents’ chagrin. In elementary school, students want to be independent, too, but as they progress, they become more dependent on the teacher. By high school— if talk via the old model— They are waiting to be told what to do. But high school is a time when the students strive for independence should peek. Teachers can encourage this drive by giving students an opportunity to devise their own projects within defined guidelines. For example, students could have a writing assignment in which they pick the topic. It could be a restaurant review, with each student reviewing a restaurant of his or her choice. Collaboration is an important part of the culture of the blended classroom. Students love to work with peers, especially when working on a project they selected. The main attraction of school for most students is peer contact. If students make the environment of a friendly, collaborative workspace where students feel comfortable, more learning happens.